2008 Silver Award Winner, Architecture Category, Independent Publisher Book Awards. and Winning entry, General Trade Illustrated Category, in the 2008 New England Book Show sponsored by Bookbuilders of Boston. This book is best read slowly, as in one "thing" a day, or even a week. It's a nice jumping-off point for taking each idea and running to the web for more info and search for architecture that confirms each point. Makes an excellent gift. 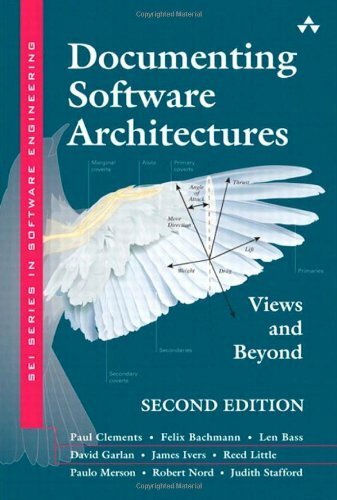 I do not have any real design sense, I can't draw, and I don't know anything about architecture - but still I love this book.I'm a software developer, and I'm constantly amazed by how many parallels exist between the software design that I do and the more concrete, physical design that architects focus on. Some of the entries in the book are architecture-specific, but for the most part thisbook is just absolutely packed with wisdom about design in the abstract.I keep it on my desk at work and flip through whenever I have a down moment.101 Things I Learned in Architecture School always leaves me with something to think about, and I'm sure it makes me a better developer. Good for a giggle - not a very heavy book. As I said this is not a heavy book. Very approachable for students and will introduce you to all the terms that professors are going to say. 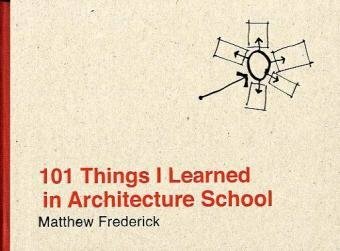 Great for a giggle after you graduate and look back at all of the silly things that you learn, do and worry about in architecture school. I have a BA and MA in art but always felt like I was a missing something...the structure that grounded the imagination. I enjoy building/remodeling and, because of my ability to conceptually understand how forms work together, my husband always said I was an Egyptian architect in a past life and probably worked on the pyramids. This little fun-to-hold book is the answer to my prayers. It puts in words concepts I already subconsciously understood, but didn't realize were architectural in origin; like #34 "Frame a view, don't merely exhibit it" (as a designer, work to carefully shape, size, and place windows such that they are specific to the views and experiences they address). This is my new favorite book - bought the first copy in San Francisco at the DeYoung Museum gift shop - liked it so much I bought three more as gifts.As a professional event planner - I've already applied some of the 101 tips to the design of my tented installations. 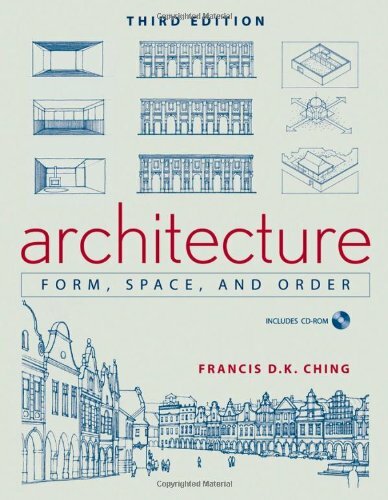 No need to spend years in architecture school to learn the theories of architecture - this is a great source of easy-to-understand information as well as a great value...and, the physical design of the book is like holding a little piece of sculpture.This may be the smallest most important book you ever buy. Does it seem you’ve formulated a rock-solid strategy, yet your firm still can’t get ahead? If so, construct a solid foundation for business execution—an IT infrastructure and digitized business processes to automate your company’s core capabilities. 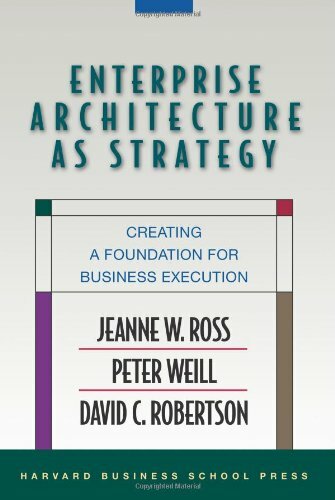 In Enterprise Architecture as Strategy: Creating a Foundation for Business Execution, authors Jeanne W. Ross, Peter Weill, and David C. Robertson show you how. A Compelling Case for Enterprise Architecture Now! "Enterprise Architecture As Strategy: Creating a foundation for business execution" presents a compelling case for adopting, advancing, and maturing Enterprise Architecture as a key component in the business strategy.This tightly-written book provides actionable guidance without being overly prescriptive.Jeanne Ross, Peter Weil, and David Roberson base their guidance on extensive business research, academic study, and statistical analysis of real-world business results.The authors illustrate their findings through readable business case studies that business professionals will appreciate. The authors make a clear case that companies adopting enterprise architecture to build their foundation for business execution can achieve stellar results, and avoid the undesirable consequence of agility-favoring natural selection in the marketplace.They provide a concise and understandable framework for building the foundation for business execution, and remind us to apply patience and provide support while we build architecture maturity and learn from each step in the framework. The authors set the high-watermark for enterprise architecture books.They reveal how enterprise architecture is at the nexus of business and technology, and how it can and should be used to align IT with the business operating model.This alignment builds synergy throughout the organization.Though not said in as many words, the point is clearly made that even professionals in the IT department must consider themselves as business professionals first and foremost.They are business professionals who know and apply information technology to enable business capabilities. I dont need to read this book to learn EA. as one of the chapter title, EA guide to outsourcing, I would just hire somebody to draw up an enterprise architecture for my client. The authors make a solid argument that an Enterprise Architecture is a "foundation for execution" that supports the company's strategy. Four stages of maturity are discussed in detail with helpful case studies. A fifth level of maturity is offered up as a vision for the future. Senior executives and managers across all functions of an enterprise should read this cover to cover. IT management will benefit from the series of questions presented, fueling the discussions between IT and functional leadership. This book certainly helps guide the dialogue which leads to the development of roadmaps for technology, data and processes. The result of a clearly articulated and well understood enterprise architecture is a foundation for evaluating investments and architecting future systems. Excellent book with well-written material applicable to any organization considering Enterprise Architecture as a way to align IT with their business strategies, or who are seeking a better understanding about what Enterprise Architecture is...and isn't. This is an excellent book. I enjoyed reading it. It presents to me a top level, complete plan, and examples with use cases of how to implement an AE regardless of business segments. Great Book. I am look forward to the next one depicting this year (2009) and the last two years. I'm glad I bought it, and I'm glad I read it. 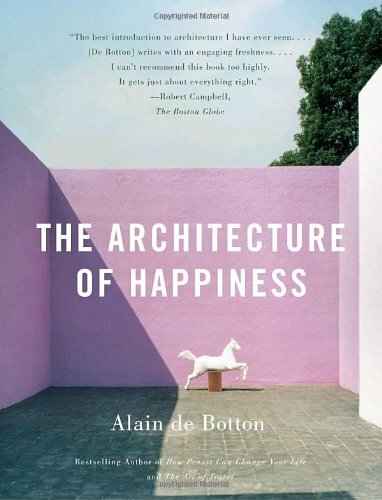 It's such an odd piece, really.The author is primarily known as a fiction writer.So all of those novelist word picture tricks are used to pass his thoughts on to us about how architecture goes about making us happy. The person who recommended this book to me must ride on a higher mental plane than I do.I didn't think the premise needed documentation. Although I sympathize very much with the intentions of the author in educating us on some basic elements of architecture very much appreciated by many of us, I find the shortcomings of the book annoing. Such a book would benefit tremendously by having more and better illustrations. Also at times I find the text too elaborate and off track, especially in the first chapters. I have read most of the customer reviews listed on Amazon - unfortunately only after I finished reading the book.I am impressed with the quality of authors of those reviews.I can not say I am knowledgeable about architecture.Yet that was precisely why I bought this book.To get more insight. What I found, however was a compilation of one man's opinions about architecture.Whether he likes this or that. I am finding De Botton a hard to read man.I think there is too much trying to make "perfect" sentences.However because it's not done on a perfect level, it gets tiring to read.I contemplated a lot whether I should stop the book after mere 50 pages.But I had to finish - God only knows why - so I pushed myself.There were maybe few points which I got from the book.But all in all it was a waste of my time to finish it.Sorry Alain!. I would have rated this book 5 stars had the photos been in color. The text/prose was marvelous and well reviewed by others, certainly worth 5 stars. The photos, which occurred on almost every other page well-illustrated the author's points made in the text. All would have been perfect had the photos, at least some, been in color. The book is beautiful: exquisitely bound, thick pages, vibrant purple cover, colorful and attractive dust jacket - so many things that appeal to those who are drawn to the sensory aesthetics. I was so disappointed in the lack of color within the pages. The exterior exuded, promised as much beauty within. Alas, the text and prose don't disappoint, so this is consolation. Lack of color within the pages might seem a minor point, but to me, black and white photos on every page dulled my senses, and I grew bored. Details were obscured with the varying shades of gray, but with color, details would have been more prominent on the small pages of this 8 in x 6 in book. Alright, I'm done beating a dead horse. Great prose, hate the black and white. The book deserves 5 stars, but with no color photos, I can only give it 3 stars. Spaces change who we are. This ideas is expressed by de Bottam this way: "belief in the significance of architecture is premised on the notion that we are, for better or for worse, different people in different places -- and on the conviction that it is architecture's task to render vivid to us who we might ideally be." So we should think carefully about where we spend our time. Intuitively we seem to seek in architecture what is missing in ourselves, or what will balance us, or make us whole. de Botton quotes German philosopher Novalis who said, "In a work of art, chaos must shimmer through the veil of order". This seems to be an overriding theme of the book, the balance of order and disorder. Orderly architecture combined with the chaos of daily life is humanizing and pleasing. However, if the architecture is itself disorderly then the addition of life's chaos creates that environment described by de Botton as producing "disorientation and frenzy". And more generally, "we are drawn to call something beautiful whenever we detect that it contains in a concentrated form those qualities in which we personally, or our societies more generally, are deficient. We respect a style which can move us away from what we fear and towards what we crave: a style which carries the correct dosage of our missing virtues." We also find beautiful that which is stronger than we are and admire structures of strength and substance. These are interesting and provoking ideas and de Bottam's writing is for the most part clear and rich, often seemingly unusually enlightened. This comprehensive guide has been completely updated to provide the most modern, detailed, and in-depth coverage of Autodesk's leading building information modeling software. This packed new edition features clear discussions of core topics that are reinforced by compelling examples and tutorials to guide you to Revit Architecture mastery. The expert authors use real-world workflows to show you how to immediately implement and use Revit Architecture 2011 with spectacular results. They delve deeply into every crucial topic, including how to most productively use the interface, how to create fantastic building designs with Revit, and how to produce solid documentation. They also explore such advanced topics as using Revit Architecture during construction and how to leverage the API. I order this bookto help me understand Revit. This book has gone above and beyond. I am very happy and would purchase it again!!! The book provides real life examples for work flow and deals issues met in everyday processes. It gives important guidance as to the cross platform use of data so that things would happen easier. Finally shows how no software is still enough to pull off the whole of the design, either because of design philososphy or because of company tactics. It is much better though even for beginners as similar books tend to present the possibilities of a software instead of helping the user. I would definetly reccomend this to coleagues. It's my third revit guide and this book is perfect if you want to understand more of Revit and get what comes "out of the box". The chapter on stairs and railings is worth a book by itself, simply wonderful! Awesome book for people who know the basics! I am 31 yrs old and am an advanced user of CAD. I first got introduced to Revit in version 11 and drew up a simple plan. I found it frustrating at first cause I didn't know how to do simple things like detail a section dwg so I wasnt sure I could handle a "real" project. Well, with this book I now feel comfortable taking on a full blown job.Its very informative in many ways and a perfect guide for anyone who knows the basics. I look forward to using this book as a guide and I enjoy reading it also because I feel like I'm actually learning something new! The only thing I didnt like was the fact that the illustrations were in black/white and sometimes the authors reference colors when explaining something (i.e. datum colors, selected/unselected objects)....so it doesn't really make sense in that aspect. 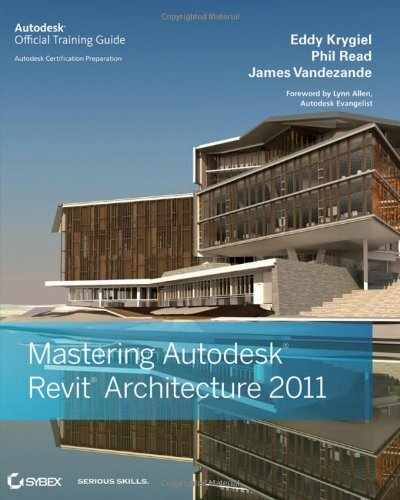 Since becoming immersed in the world of Revit, this book has been indispensable as a source of information in my daily routine.Not only has "Mastering Autodesk Revit Architecture 2011" helped me with the nuts and bolts of working with Revit, but also has shown me how to establish a productive workflow with Revit. For me, "Mastering Autodesk Revit Architecture 2011" is an excellent bridge between textbook like tutorials and the real world. By showing how Revit changes and improves the design process by using real world examples, you can immediately see how the details you learned in class apply to the overall design picture. By encapsulating the details of "How" you use Revit within the broader picture of "Why" you use Revit the authors are teaching both the ins and outs of the software as well as helping the user establish a productive workflow that will make them, overall a more effective designer. I've had this book on my wishlist for over 2 months. It's one of those things where I wait and see if I can afford it later, and then later turns into 2 months later. Let me tell you that I feel ridiculously foolish for leaving this on my wishlist for more than the time it takes to ship. If your job is in any way related to software development, you need to read this book NOW. Surprisingly I already knew a lot about what was in this volume, but in hindsight, it was an incomplete jigsaw puzzle with the pieces laying around everywhere. To complete the analogy this book gave me the picture, of the puzzle, so I knew how the pieces should look when they fit together. I will be reading this book a second time just to burn the concepts into my brain. As far as the literary quality, it's not dry like some references, but it's not overly exciting. If you're accustomed to reading tech ref documents and white papers then any book, like this, is disneyland in comparison. The authors organized it well, and it delivers the information in a powerful way, with lots of diagrams and code specimens to illustrate the concepts. I'm glad this book was recommended to me, but I get the feeling that most professionals in my industry have read this volume, so it's an important thing to read. 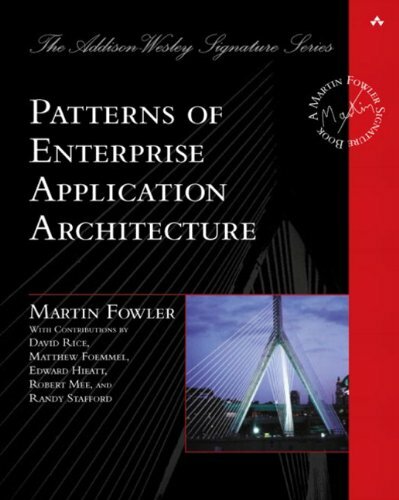 This is required reading if you are doing enterprise development.Even for it's age, POEAA is still THE foundation of the patterns that will be used daily.Some of the material, particularly the object-relational mapping patterns, will be a little to low-level to actually be practically useful (considering the existing frameworks available today) - but still it provides a good background on how this stuff actually works.That is - you probably won't need to implement your own Unit Of Work, but it's still essential that you understand the motivations of the pattern and the problems it solves. The patterns in the Book are not new, they are known by any average coder with few yrs of exp. How ever the book is a very coherent collection of patterns and still (in 2010) remains very relevant. But the book can use little updating in few areas like with ASP.Net MVC - .Net now supports MVC, services both in Java and WCF etc. This is a practical straight forward guide to Architecture for the non-architect.Also of use to those interested in building design and architectual history. Vision is better than a thousand words. This graphic book makes you very easy to understand the architectural vocabulary. Not only good for student but also good for architectural practicer. Most USEFUL Book on Architecture EVER! My husband bought this book for me when I decided to go back to school to study architecture, and it has turned out to be sooooo helpful.I have usedit in every course I've taken; it makes studying for tests so much easier.It has a fabulous index so you can find what you are looking for right away, and the illustrations and page layouts are great.This book is a must for any architecture student.I really can't recommend it highly enough. is an invaluable reference for the student and architectural practicioner as well. Somewhere near the very beginning of my lecturing career, I showed a slide onscreen and was trying to point out a unique feature of a home. Gesturing toward the screen I said, "that thingie over the window..."
I was mortified. What a dreadful mistake for a "professional" lecturer to make!! Since I planned to give many more lectures, I came home and bought this book from Amazon. When the parcel arrived, I quickly opened it and was delighted to find the easy-to-read drawings. Ching makes the most complex architectural graphics easy to see and understand. Using this book, I gave myself a crash course on "basic architectural terms" and since then, I've given 200 lectures and never used the word "THINGIE" again!! It's quite terse and needs many more diagrams for better visualization of difficult concepts. It's a book more for those who like reading theory and don't need a lot of examples. I needed this book for a class, and so far is has been pretty good.The topics are well explained, and the material is presented in a understandable fashion. The bible... Nothing like others. 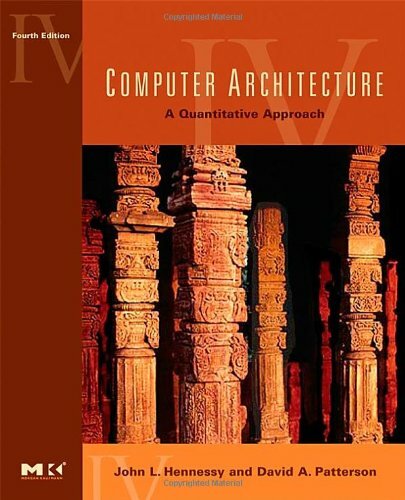 For those who have never read this book, I'd emphasize that this is not a computer architecture book that explains some basic stuffs. Instead, this book focuses more on the performance aspect of the computers and I'd say this is the ONLY worthwhile book that discusses from that viewpoint. So, if you are to study the computer performance, your choice is either reading this book or reading tons of papers published by researchers or both. It means you must have a good understanding on the computer architecture before reading this book. My only complaint is that though the book is available only with paperback now, they didn't reduce the price. It's still worth the price, though. I have been trying to return this book because a get confused and i didn't need this book. Can you tell me where i can send back the book please? Though this book is really good. TASCHEN's Architecture Now! 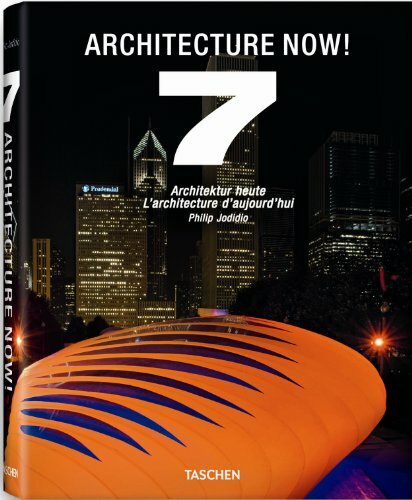 7 features an arching overview of today's architecture, from modern to radically avant-garde. 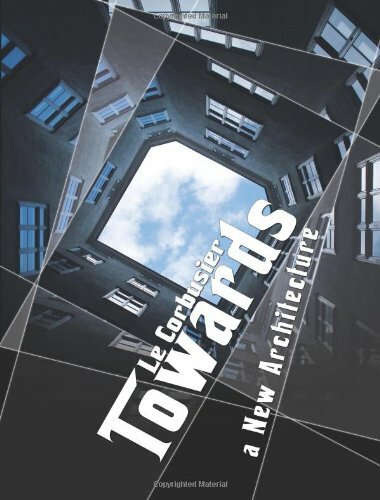 As with previous books in the series, Architecture Now! 7 includes a broad variety of projects from around the world, as well as some works of art that have a direct relation to architecture, from the likes of Giacomo Costa or Shinro Ohtake. It also explores how the recent economic downturn has led to fewer large-scale projects, but has also stimulated creative thinking, as architects find new ways to work imaginatively inside budget constraints. Large-scale works include the futuristic Chinese Central TV Tower in Beijing (OMA) and the Burj Dubai (SOM), the world's tallest tower and centerpiece of the Gulf region's most prestigious urban development to date. For anyone interested in the zeitgeist and building design in the 21st century, Architecture Now! 7 is an essential work of reference. Easy-to-navigate illustrated A–Z entries include current and recent projects, biographies, contact information, and websites. The book was in great condition and it arrived when I expected it to arrive. The book contains elements to architecture that you cannot find absolutely any where else. It talks about experiences and ways that structures can bring out human emotions and feelings that one cannot register by simply entering into a building. Though this book explains what happens when you are in a building that evokes emotion. Its great. 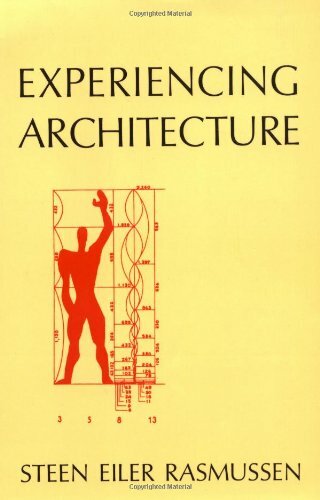 7/09 Steen Eiler Rasmussen's "Experiencing Architecture" was my introduction to Architecture in the 1st semester of my 1st year (1964) in Architecture School. We were also assigned Robert Venturi's"Complexity and Contradiction in Architecture" during my 2nd sememster. While I do appreciate Venturi's work, I am still scratching my head over his maiden literary effort. Rasmussen's straight forward explanations and illustrations of form, space, volume and light sank into my eager but confused brain. It helped me understand what Architecture meant as an expression of civilization and culture. When I had the opportunity to teach an introduction to Architecture after I graduated, I was warned that Rasmussen's work required a college level mastery of English. If reading comprehension is a challenge, be forwarned. 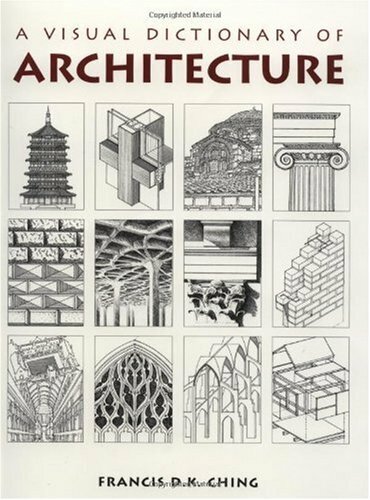 This book was required reading for my introductory class on architecture.I was debating whether I should be an architect or not and this influenced me to pursue it. It is one of those rare theory books that I had fond memories of reading.Rasmussen, unlike most writers, is very even handed in his presentation and doesn't steer the reader into any particular style.He provides the reader with a clearer understanding of architecture and the role of architects in shaping the built environment. In spite of it's age the book is still like a bible for people interested in architecture and used a lot in education. The language is not too complicated, its not too technical and there are a lot of simple but good illustrations. The book is an excellent intorduction to Zumthor's architecture. His pursuit of "the essential" in architecture is explained simple and clear. In seeking 'factual truth' in architecture, Zumthor explains what matters to him in his consideration of "specific" contexts and issues and corresponding architectural answers. This book let me better understand why his buildings exude such extraordinary aura and where his ideas may stem from. It's highly recommended.One of the real masters in architecture today certainly understands how the tactile presence of the book (how it is made with care) can give readers a pleasure or even a sensation. And, it makes me think that the content of the book is represented in a physical presence of this cloth-bound book. In the book, Zumthor talks about his desire to design a building that takes on its own life afterwards without any rhetoric or any further explaination to make one appreciate his architecture. The book itself seems to be doing just that. It may be something digital readers can never deliver to us. In many ways, the reading of this book reminded me of the writings of Louis Kahn: both explicit and metaphorical reflections on the inner complexities of the apparent simplicities of daily life. The selections of almost inscrutable photographs, extreme close-ups of sections of Zumthor's house, act as as another way to explore the intensity of the artist's and his art's soul. All along the book, and in a very poetical manner, phrases seem to be left hanging unfinished, as for one's own mind and sensibility to put together the pieces of and intriguing and inspiring puzzle that remains open and to be developed by the reader. While the voice of a master is always heard, the message is delivered with the subtlety of his work, as for the reader not to feel forced into a way of thinking, acting or perceiving, but invited to stay with eyes, mind and all senses open to enjoy the pleasures of life and the possibility to contribute to them by one's own minor but never meaningless actions. 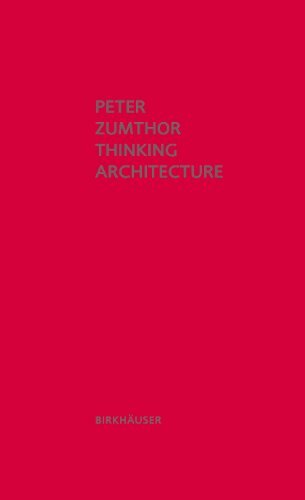 It reflects the knowledge of a big architect that Zumthor is, one thousand words that make you learn a diferent way to look at things and to create a rational way of thinking about architecture. Stop reading reviews and start reading this book. Zumthor is incredibly talented... there is quite some difficulty in not only creating simple, beautiful, natural and intentional architecture, but also something even more difficult in relating it verbally. Thinking Architecture does an amazing job at that. This is a book you could return to every few months, and it will re-awaken your senses to the architectural world around you, as well as your memories and experiences with those environments. Zumthor truly does give an excellent source of thoughts and events in this book. Extremely recommended, "Atmospheres" as well! A different way of "thinking architecture"
Revit Architecture is the leading Building Information Modeling (BIM) software for architects and others in related fields. Written by renowned Revit trainer Eric Wing, this simple, yet engaging tutorial teaches you the program's basics. 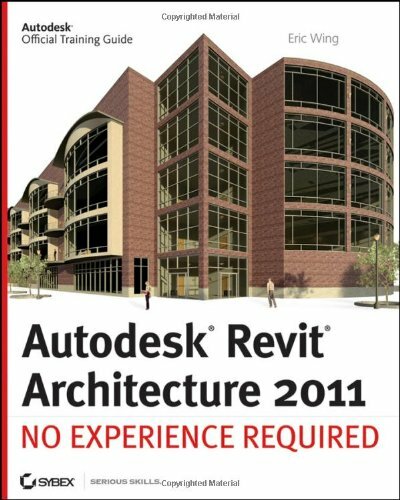 Although I was proficient with AutoCAD, I didn't have any experience with Revit before I purchased this book.I have now gone through the entire volume, reading every word and following along with every example. There is a real problem with quality control in the book, however.Other readers have commented on the east-west discrepancies in the book; the author might tell you to modify the east entrance when he means the west entrance, for example.This flaw didn't really bother me, as there are plenty of helpful illustrations in the book, so it's usually possible to figure out which side of the building he really means.The bigger issue has to do with the sloppiness of the tutorial procedures.Many of the steps that the author tells you to make do not work properly.That is, he might say "do X, and Y will happen," but the program might not allow you to do X, or when you do X, Y does NOT happen.Other times, the instructions are confusing or even incomplete.I once spent 30 minutes trying to troubleshoot my model, only to realize that the author had omitted to tell me to click a certain button.These errors are rare in the first few chapters, but become increasingly common later in the book.Chapter 21 is particularly bad in this regard; the author even has you modifying a wall that does not exist, if you follow his instructions!It seems likely that the book's procedures were never independently tested by someone untrained in Revit. I don't know if there is a better book for learning Revit.This one will certainly work - just be prepared to encounter a fair number of unexpected problems, and to figure out solutions to them on your own. Look no further. This is the book to get if you want to learn Revit from the get-go. Unlike other books that cost twice as much and are purely theoritical this book takes you into the driver's seat where you will get your hands on the steering wheel. You will get "down and dirty" going from chapter to chapter in a logical progression as you "build" (in Revit you build, not draw)a five story office building. My suggestion to anyone wishing to really learn the program is to "build" your own project right next to the office building. This way you can try out the various skills as you acquire them on something that is truely your own and therefore boost your self-confidence. You can't go wrong with this book. Just needed to balance out the one negative review (which offered no specifics). This is a self-paced tutorial using well established learning techniques and covers a broad range of commonly used skills. But, as others have said, it's not an all-inclusive reference. It is best used in combination with something like "Mastering Autodesk Revit...". Highly recommended. I taught myself Revit with one 24 hour beginners class from Autodesk, the online tutorials from Autodesk University, helpful information on the online Autodesk Users Group and the 2010 version of this book. It involved a lot of diligent study and included doing many of the step by step lessons and tutorials in this book. I started in June 2010 and by August 2010 I banged out a complete design and set of construction drawings for a house renovation and expansion. Since then I have completed many other projects using Revit and continually refer to topics in this book. Great book, not so great version. is the better version of this book. It has better translations and images. Schools no longer use the Towards a New Architecture because they find Toward an Architecture the better more correct version. Amazon sells the new version as well, and I would recommend people to get that version instead. say what you want about him and the deleterious effects that some of his theories had, but it's nonetheless essential reading for anyone interested in architecture. it's hard to believe that he wrote this when he did. most people still haven't caught up yet. Not a very exciting read and a little hard to understand. If you are an architecture major or have an architecture class it should be helpful and probably a good book. I bought this book when I started architecture school and it has been a part of my life ever since. I believe that this is essential to understanding the current architectural trends and a must for any architecture student. Each title in the Oxford History of Art series provides an overview to a particular time period, style or movement. This book focuses on modern architecture, starting with Art Nouveau in the 1890s and continuing through the modernist or International style of the 1950s and 1960s. 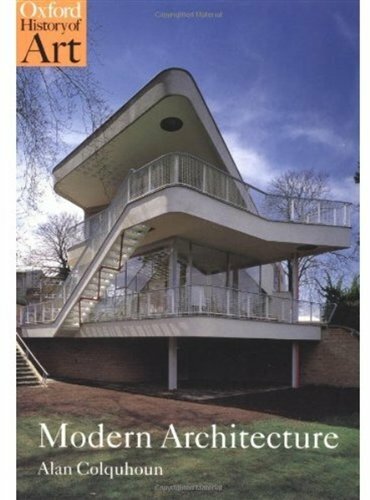 In the introduction, the author explains that he is using the term "modern architecture" to mean "an architecture conscious of its own modernity and striving for change" (p. 9). He describes the historical context at the and of the 19th century, traces the development of different styles, and discusses the role of key architects in each movement. This book is generously illustrated, with many color images complementing the period black-and-white photographs of interiors and exteriors of modern buildings. There are also many architectural plans, elevations, drawings, and sketches. It is a sturdy paperback with a strong binding. It would be useful to undergraduate students researching 20th century architecture, as well as general readers interested in the subject. Didn't even open this book for my architecture class but if you are an architecture major than this book might be great. I am an architecture student, and this is a great book for the money.The photography is well done, with a good selection. This book provides a much easier way to view modern architecture than the usual method-To study each individual that impacted the world of architecture through this modern method and perspective of architecture. Consequentially, this book is easy to read but the depth isn't there, I would prefer the other Modern Architecture books,(see my other reviews). But for the casual reader, or anyone interested in history of architecture from the student to professor,this is an appropriate choice. Rather than just writing a history of modern architecture, Colquhoun distilled a polemical theory into this succint historical writing. 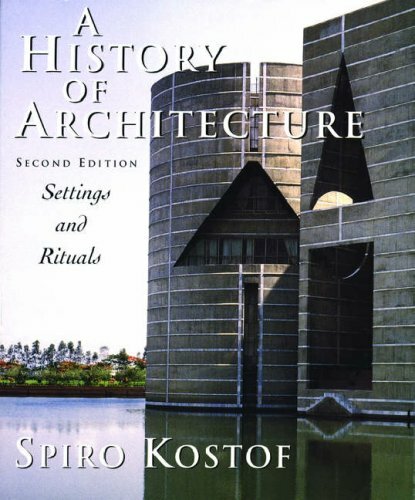 This book could be read as a history book and a polemical theory book on architecture in the 20th century. Rather than chronologically writing a survey of modern architectural history, Colquhoun placed emphasis on certain modern architects (Loos, Wright, Corbusier, Mies and Kahn) whom he thought, had brought substantial influences to the modern architecture. He used these architects as examples to illustrate the formation of modernism and the phenomenon of modern society. Other than just analysed the work, Colquhoun brought a dynamic discussion of architects' theory, criticism and also relevant references. From there, he provided his critical point of view. His discussion on Corbusier, Mies and Kahn were fascinating and profound. It would certainly open a new chapter for those who already knew these architects very well. Colquhoun used Corbusier and Mies as two representatives of a dialectic flows in modern architectural movements: 'functionalism' and 'rationalism' accordingly. The whole book ended with the works of Louis Kahn. To Colquhoun, Kahn's 'Rational Functionalism' provided a way out to modern architecture. Get the definitive guide on designing applications on the Microsoft application platformstraight from the Microsoft patterns & practices team. Learn how to choose the most appropriate architecture and the best implementation technologies that the Microsoft application platform offers applications developers. Get critical design recommendations and guidelines organized by application typefrom Web, mobile, and rich Internet applications to Office Business Applications. You’ll also get links to additional technical resources that can help with your application development. Give you a great overview about architecture and how microsoft products may help you. It's a good guide that expose MS products and their pros and cons over each situation. Become a little repetitous at the end when I was expecting to go deeper in the subjects reported before. Given all the technologies both new and old supported in .NET and Visual Studio it can quickly become unclear on when to use what technology for a given situation.There are so many data access and ORM technologies in .NET do you know which one is good for a given project? This book offers clear guidance on when to use what technology, framework and pattern for a given scenario.An example it provides an easy to use table for when to use a dynamic data application, Entity Framework, Linq, or just the ADO.NET api. This book is packed witih great guidance.Now only if it were available on the Kindle! 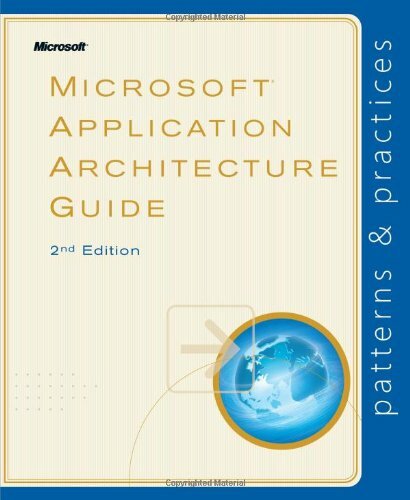 Whether you are an architect, developer, product manager, project manager, analyst, Microsoft Application Architecture Guide (Patterns & Practices) is a great desk reference. Please note that this reference is not an end-all-be-all for programming, but rather a 'guide' to aid in planning and designing any project (regardless of size and scope). In addition to the Guide, I'll use Erl's SOA books or Dino Esposito's references, and others, but the Guide is usually the first place a I begin to make certain I do not make any expensive mistakes along the way. I find it important to mention that this book had more than 30 collaborators from within Microsoft, its partners and its customers, so its depth in knowledge is expansive. I didn't use the first edition of the guide as much as I thought I would when it first came out oh so many years ago. But when the new 2nd edition was released I was interested to see what changes they had made. I was very surprised to find it so useful. There is a lot of great descriptions for the different architectures possible with the .NET framework. I found this to be a great refrence for documenting architectures for the projects I work on. It helped me organize my thoughts, and consider items to include (and to leave out) of my architecture documentation. One thing I noticed was the printed version is different than the PDF available for download from the CodePlex web site. Not sure why they are different, but I found the print version a bit better to follow. Man, was I glad to see them print this thing.I had bugged them about it, but they said it wouldn't pay for itself.It's good to see they changed their mind.I have been lugging it around in a binder, and that had been less than pleasurable. I like keeping this with me because it serves as great reference of all the things I am supposed to remember, but often forget.When it comes time to begin a new architecture I like having my valuable books nearby, and this is one of them. This book is packed with guidance on Mobile applications, Rich client applications, Rich Internet applications, Service applications, and Web applications built with .NET.The solution guidance provided in this book is all 100% .NET and Microsoft centric.It maps all the important aspects of software architecture to ways to implement them in .NET or with Microsoft products.This is the compass you need to find out what Microsoft has to offer for building different types of architectures. The book includes individual chapters on designing Mobile applications, Rich client applications, Rich Internet applications, Service applications, Web applications, Hosted and Cloud Services, Office Business applications, and SharePoint LOB applications. The book also includes some nice appendixes.They include the Microsoft Application Platform, Presentation Technology Matrix, Data Access Technology Matrix, Integration Technology Matrix, Workflow Technology Matrix, patterns & practices Enterprise Library, and a patterns & practices Pattern Catalog. The book primarily focuses on architecture, but each chapter provides resources for guidance on the details of implementation for the technologies mentioned in that chapter. 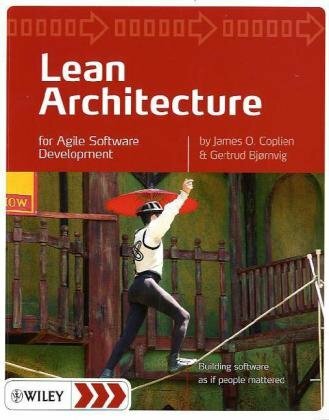 The book focuses on the technical aspects of .NET architecture.It does not cover the soft skills needed to be an architect, or cover the customer facing skills need to communicate with the business stakeholders.You won't find much on process either, just an overview.These missing topics have not taken away from the book, they have made it a stronger book.There are plenty of resources on how to execute the soft skills and architecture process.This book concentrates on how to communicate with the development team through solid design and well known patterns and principles. If you are a .NET Architect, Developer, or Project Manger of a .NET team, you should have this book at your side.As a matter of fact, I would recommend making one of your interview questions for your team members - "Tell me what your favorite part of the Microsoft Application Architecture Guide 2nd Edition is?" If the candidate does not have a favorite part, you get back that hour you almost wasted on them. This was my first attempt at ordering a book online.I fully expected the product to be in worse shape.However, there were only a few page corners bent and all of the pages were intact.The item arrived very quickly.I am very pleased with this purchase. Probably won't use this seller again. I purchased a book from the seller and my order has not been shipped, almost a week later.. A little disappointed since I always purchase my school books from amazon and I have not run into any problems until now. I sent an email to the seller hopefully I receive a response in a timely manner. It came in good time and was in the condition it was told to be in. I was very happy with the purchase, mainly because it was $50 off retail price and was free to ship. I have long wondered why Vitruvius is so often quoted but so little read.Now I know! Much of the information in this book has nothing to do with architecture: phases of the moon, water clocks, sun dials, water-organs, odometers, etc.Much of it is anything close to scientific or valid: `people sitting present open pores into which wafts of air penetrate', people from the south have ` less blood because of the impact of the sun', `heat attracts and draws everything to itself', etc. With respect to architecture per se, most of the buildings referred to are unknown today.Certainly, none of the buildings designed by Vitruvius himself have survived.In addition, the original illustrations are lost.Though drawings made by Palladio in the Renaissance are included, they are, as is pointed out, often fallacious.Overall, it is therefore difficult to grasp the essence of what Vitruvius aims to convey. The translator certainly does his best but the author's original style is certainly not pedagogical by our standards.In fact, the book is closer to a collage of various notions than to an organized presentation. All in all, most persons interested in architecture will find it more worthwhile to read something else. A book which was at the heart of architectural theory for over 1500 years can't be entirely outdated.Many of the issues and ideas which Vitruvius brings up are still relevant to modern architecture and, at the very least, give us an idea of the theory behind much architecture, both before and after Vitruvius' life.Of course, it can't be relied upon as a comprehensive guide to architecture and there are some points which are innacurate in terms of history or theory, but you take this book with a pinch of salt, and accept that this is where architectural theory started, and you have to respect it for that! 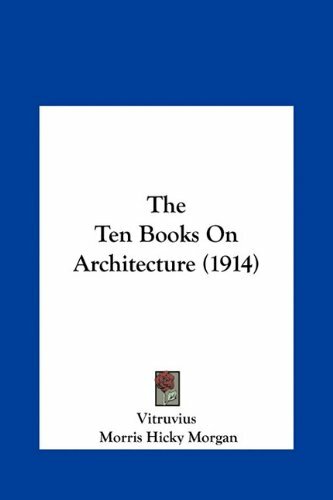 Vitruvius's 10 books (or chapters) on architecture lets you view life through the lens of the 1st century BC builder. While Vitruvius does explain the principals of how to build various buildings and rules for the construction and use of columns, perhaps the most amusing part of the book is his description of life and the things that govern it. Throughout the book he describes certain materials that should be selected for building and their composition of the four basic elements: earth, air, fire, and water. In some sections he spends an excessive amount of time making a point, and some points are glossed over. Many of the things he describes we are still doing to this day. A fascinating read all in all. however, it is an ancient book... I used the dimensions and architectural scales to build my model of a greek temple. Very informative when it comes to that, cause not many books have to-scale drawings of the building. This is a good book, but Granger's translation is better. I really enjoyed reading this fascinating book.However, when I compared it to another translation (a two volume edition, translated by Granger) it seemed that it was missing some bits of information. It was easier to read though, so if you are interested in a casual read, this is the book for you.For a research project, you should probably stick to Granger's books. The post-Ajaxian Web 2.0 world of wikis, folksonomies, and mashups makes well-planned information architecture even more essential.How do you present large volumes of information to people who need to find what they're looking for quickly? This classic primer shows information architects, designers, and web site developers how to build large-scale and maintainable web sites that are appealing and easy to navigate. Lots of good information in this book - it covers a huge amount of information related to Information Architecture (as you might expect).Very in-depth, and a great resource.I only give it three stars though because it isn't really a great read.I know, it's a book on IA, what do you expect, right?The book is college textbook size and written in that dry O'Reilly-book style that makes it something you just have to slog through.So maybe I have too high of expectations or too short of an attention span, but it was a big challenge for me to make it through this whole thing.Again, I'm glad I have it on my shelf for reference though. The third edition keeps the book pretty up-to-date.Other than some random old school Netscape screenshots, all the content is totally applicable in today's world. Provides in depth coverage of how to organize and provide access to information for the Web. I like it because it gives you a comprehensive tour of all the major concepts, systems, and strategies used to organize information for your web site. Because it covers a lot of ground, its not necessarily a how-to guide book, but rather is more of a deep introspective of what information architecture (IA) is, as an academic discipline. In that regard, it is quite insightful and offers many good resources of how the field evolved, and where its at today, and what role it plays in the ever changing business community. If anything, as a result of reading this book, I found that I now have a deeper appreciation for what it takes to create a systems-wide approach towards the organization of information. In particular, an appreciation for what it takes to design information for users to help them find the information that they need. 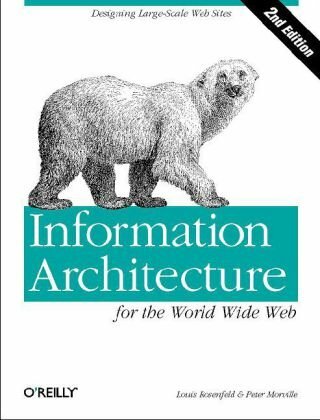 This is one of the most complete and thorough resources on the topic of Information Architecture. As relevant today as when it was written. A must read for Web Developers and other folks whose work it is to design, produce and publish web sites. I'm a developer building a company-internal website and I'm struggling to organize all the information it will contain. I bought this book hoping to ease that struggle. What I found is for a technical person like me, this book was so useless that it has compelled me to write my first Amazon review in years. I planned to read it cover to cover. After 50 pages I realized that I haven't really read anything at all yet. So far it's been ridiculously verbose, rambling, and content-free. So I gave up and started skimming. I couldn't find much better in the remaining pages. Page after page of touchy-feely gobbledygook that has not helped me organize information at all. To explain the concept of equivalence we have another diagram: "A=B" inside a circle. (Figure 9-21) Does such a diagram really enhance anybody's understanding of the concept of equivalence? Why does this diagram even exist in the first place?